Please Note: These LS1 swap parts are made in batches, and can sometimes take weeks to fulfill orders. We prefer to take these orders over the phone, so we can then only charge you for parts as they ship. If you order here, online, your credit card is charged immediately. If you have any questions about ETAs on any parts please call us at 972-422-7170. This cart entry is for the complete transmission crossmember assembly built by Vorshlag Motorsports and Dallas Performance that is made to be used with a T56 or T56 Magnum 6-spd transmission behind an LS1 V8 in an Left Hand Drive E36 chassis. This is sold outright as well as in our Stage 0 E36 LS1 swap kit. This entry includes the fabricated transmission crossmember, nylon bushing, and transmission mount bolts & washers. All alloy steel construction, powder coated black, with Laser Cut flanges throughout. 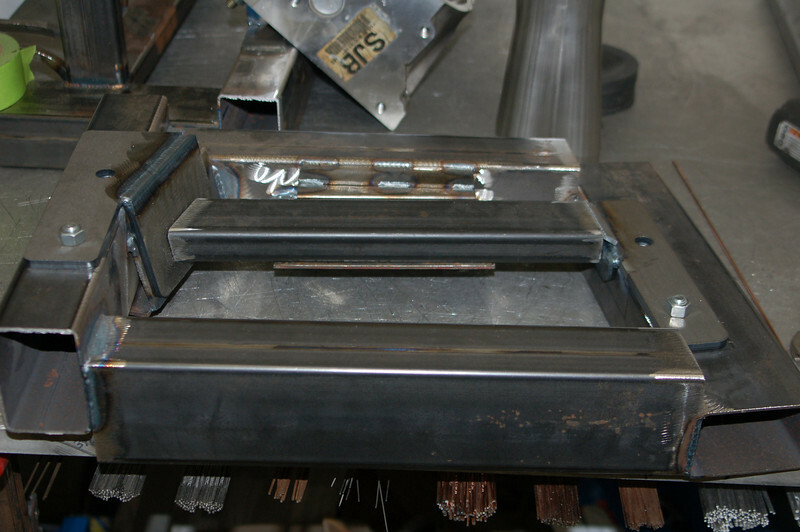 TIG welded construction and precise fit-up using our elaborate welding fixture for repeatability and production accuracy, shown below. We recommend using this Transmission Crossmember Kit with our E36 LS1 Motor Mount Kit for the ideal engine and transmission placement and driveline angles. NOTES: This crossmember fits the mounting holes in a 1998-2002 Camaro T56 or the aftermarket Tremec T56 Magnum - not anything else. Not an automatic, not a 5th gen Camaro TR6060, not some random other box - just the two 6 speed manual transmissions we listed. The E36 LS1 engine mounts, headers, and steering shaft are not included in this entry. This is a 5.0 pound shipment, with all packing materials and box included.